The K38p Van Mount Work Platform made for highway maintenance and Installation. 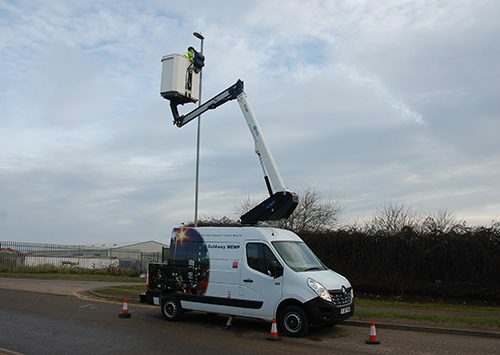 The K38p Van mount Work Platform has been designed specifically for the Street lighting maintenance and installation sectors. The conversion can be modified to a cutaway van mount. This allows for a greater payload and makes the vehicle easier to manoeuvre within urban areas. This makes it perfect for inner city streetlighting maintenance and installation. The full van conversion with a K38p boom boats a 13.7m Working height, 7.9m Working outreach with 120Kg safe working load in the basket and 6.05m working outreach with 200Kg safe working load in the basket. The cutaway version still has the same great Working height, 8.2m Working outreach at 120Kg safe working load in the basket and 6.8m Working outreach at 200Kg safe working load in the basket. Our Streetlighting customer wanted to add extra security with 1Kv boom and basket protection. This comes as standard on all the Klubb van mounts. They also needed a variety of optional extras to ensure the work was being carried out efficiently and safely. These included Reversing camera, Roof beacons, Chapter 8 graphics and a key out system allowing the vehicle to be locked while the engine runs, and the operator is at height in the basket with no disruptions from below. All these accessories are fitted in house by our professional team. This client is eco responsible and so chose the option of Green pack Technology on the van mount. This allows for the engine to be switched off and the boom runs off battery power, a much more economical way to work. It was also extremely important that the vehicle was under 3.5t due to the licencing laws and the age of many of their employees. We have created the K38p Van mount, with all the necessary aspects within this weight enabling anyone to drive this unit. This includes a variety of internal storage to keep the vehicle tidy and safe and doubles up as a mobile workshop to keep lead time down on maintenance projects.